The Wonders of Duck Tape! Since my last ride through the countryside, I decided I was going to go on a tour within the week. I began planning the very next day. Lists and routes made, plotted and printed. I was a bit limited on when I could leave since Loke had vet appointment on Wednesday (May 23) and my SIL was coming over for a movie night Friday. It gave me plenty of time to think my lists through and even get pre-packing done. The vet visit on Wednesday had Niclas giving Loke another thorough going over before deciding to go through with the surgery. I also decided Loke should have his glands checked. Good thing. Apparently they were quite bad though he’d barely given any symptoms! He was quite miserable through Thursday, but back to hyper on Friday. As the packing progressed I felt a little guilty for my SIL having to step over and around piles of camping gear, but she was quite cheerful about it. Encouraging and curious about my outing more than anything. I’d planned to leave on Saturday, but with all the running around I did on Friday to shop for touring stuff and fixings for my home-made orange chicken as well as helping cook it, I decided my ankle should have a day to recovery. So, Sunday it was. I was a little peeved with Saturday though. It was the coolest day we’d had in days. It would have been perfect for us. When I woke yesterday though, I was encouraged we’d have another day like Saturday when I woke to 40 F (5 c) about 20 degrees cooler than Monday through Friday mornings. Temperature is important when your cycle partner is still wearing half of his winter parka. Brushing that shedding coat out is an unending task. After a bit of a frenzy, the car was packed and off we went toward Sala Silver Mine where I planned to start my ride. Sadly, the temperatures had climbed quickly since I’d awoken to the nippy morning. I to battle my nerves as we went. Though I’d gone over the lists countless times, I still felt convinced I’d forgotten something important. That feeling made my tummy do flip-flops. Soon, we were at the old silver mine and not far from one of the shafts, Jens walked Loke around as I unloaded the gear from around the trike. As I began to organize everything, I started to feel a little calmer. Which was good. Working with a fluttery tummy is never fun. I was a little worried about the sharp climb in temperatures though. Barely 4 hours since I’d awoken to a brisk 40 F, it was already over 65 F. Throw in utter calm air and a sky of flawless blue except for the very warm sun… well, I was a bit concerned what noon or 2 pm would bring. In what seemed a very short time, everything was ready to go. I said bye to Jens, settled into the seat and clipped in. There was a bit of a conflict as Loke and I began our journey. It’s one that always springs up when I begin a ride in new territory and the starting point is something as sprawling as the environs of an old silver mine. My furry companion wants to rip across that first mile at 15 to 20 mph while I want to stop for pictures which includes signs. I forced a compromise which Loke fought with every bit of strength he had. The tether on his spring bar was pulled out a full 3 inches as he desperately tried to run, but I would not give up taking pictures of the buildings and scenery even if I skipped signs. Unlike the other times when I’ve gone out with the trailer, I noticed it’s presence this time. Before, the trailer has only made it’s weight felt when trying to drag it up a 20% grade while exhausted from battling 25-35 mph hour winds for 2 days. Right from the start, the trike felt a sluggish and heavy even with Loke pulling like mule with a carrot dangled at its nose. Looking back on the later events, I suppose that should have been a clue though I was absolutely certain it wasn’t overloaded. Once we were moving, the last of my nerves fell away and I went on with a sense of anticipation and a big smile. When I actually let him go faster than 6 mph, Loke had that tongue flopping husky grin. Otherwise, he kept giving me nasty looks with his ears angled back as if to say, ‘MUST you?’ even when it was slowing for speed bumps. It didn’t help the trike still felt unresponsive and more work than usual, trailer or no. I kept checking to make sure neither brake had gotten stuck or something silly. Someday, I think I should spend a day at the Sala mines. The shafts are unworked now though there is a search on for another vein they believe is close to the one which was dug out. Now, it’s a tourist attraction with tours of the mine and even diving in the flooded areas though I think I’d skip that. They even have hotel suites in at least one of the shafts which I think is neat. Probably a bit chilly down there. Would be nice to get a closer look at everything. The silver mine was soon left behind and I faced a prospect of a busier street. It didn’t look too bad, but I was more than happy with the discovery of a cycle path that ran in the same direction with it even if out of sight. The path took me to a quiet residential loop and I had to do a little back tracking to a small dirt road to come back to the road I needed. I didn’t have to spend long on the higher trafficked road and I probably could have avoided it all together if I’d looked a little harder for a connection to the cycle path that joined it later on. By mile 2, I already put socks on Loke just as a precaution. Gotta save those feet as much as we can! Even if he hates the blue cloth bags reinforced with duck tape. A bit blurry. Maybe I need a mono-pod for using the telephoto lens at max range? Once we were out of that residential area, we felt it. The SUN. By then, it was almost certainly over 70 F and without even the partial shade of the first mile and a half or so, Loke started to get quite warm. It was perfectly clear from horizon to zenith so not even the faint chance of cloud shadow. I’d hoped it would be a little better once we made the turn to more secluded country roads, but sadly not. The road turned out to be a dirt lane, but smoothly packed except for the loose rocks in the center and occasional scuffed areas. It ran right through huge stretches of fields. The closest trees were 100 yards away at the least. Fortunately, I’d brought the umbrella this time. I made sure to go slower and offer Loke water every half mile or so. Then we’d sit and listen to the bird song in the still air until he wasn’t panting so much and I felt certain his drink had settled. It made for slow going, but I was out and loving it. That’s the whole point of riding and touring for me. Not how fast I can cover x-number of miles, but how much I enjoy myself regardless of speed. During this stretch, while sitting in one of the incredibly rare and unexpected patches of shade to let Loke’s most recent drink of water settle, a realization came to me. I wasn’t suffering. The day wasn’t as hot as most of last summer, most of which stayed between 85-95 that kept us from going out with the trike. It was as hot as some days in 2010 where I simply couldn’t put my nose out the door without feeling nauseous from the ‘heat’. Temps I would have gloried in as being ‘perfect’ back on the Gulf Coast made me sick, particularly if I was out of the shade. But it was different on this ride. I felt warm, yes. The sun felt hot on on my face and clothes and underneath the cap, my hair was damp with sweat. Other than that… nothing. I wasn’t obsessing about how overheated I felt or how I absolutely had to get out of the sun. I didn’t feel dizzy or nauseous. My usual complaint about why do cycle tights come in no other color but sun absorbing BLACK never crossed my mind when it’s been a mantra through the last 2 summers at least. Something had definitely changed though I haven’t the foggiest notion what could have such a profound effect on my heat tolerance. I was glad of it, but baffled. The dirt road ran for almost 2 miles with only that one tiny patch of shade which had been right up against a red picket fence outside a house. Then it was on to a small, no less shade-less stretch of the busy 56. The road was fresh paved, not even marked yet. It appears they are turning in it into a non-meeting road which are forbidden to bikes. Good thing I caught it before it’s been declared officially bike-banned. Parts of it still lacked what appears to be a cycle path they are kindly adding. I made the turn toward the church I’d seen in the distance in the middle of the dirt road stretch as soon as I could. Parts of the access road were a little rough and Loke decided he was determined to run a little. Since I could see big, fully leafed trees ahead, I let him. We hit a pot hole I didn’t see until too late. We hit it and something went BANG and it sounded like my trailer dragged on the pavement. I stopped to look back at it, but it seemed fine and moved along smooth enough when I went forward again. The grounds of Kila Church were quite busy. First impressions of the church left me feeling indifferent to it. I find it difficult to get intrigued by the very common neoclassical appearance, particularly when it amounts to little more than a big pinkish rectangular box with a tower. Still there were runestones to search for. With so many people around and the fact I wanted Loke out of the sun for a while, I tethered him to a very shady tree. Setting his filled water dish near the trailer’s tongue where he wouldn’t step it in, I saw what had made the big bang. It was a wonder I hadn’t lost the trailer. The picture was taken after I’d done a little fiddling. Both of the plastic clamps to either side of the bar which goes through the tongue had severely warped. The only reason the Burly had stayed with me, was because of the bar and some serious luck that the front clamp still had a tenuous grip around tongue tube. Sadly, I called Jens to tell him. He suggested I at least try a temporary repair maybe with duck tape. As soon as he said it, I realized he was right. What if this had been a tour during one of his business trips? I had to try. As I began wrestling with the trailer, I noticed two things which in all probability contributed to the clamps’ failure. One, it felt incredibly front heavy. Second, there was a pin meant to go through the underside of the front clamp which I’d forgotten to fasten. Suddenly the odd sluggish and heavy handling of the trike made sense. I was well below the 100 lb limit of the trailer but I’d packed all the light stuff in the back, with heavier food (canned stuff for heating on the stove) and water at the front. Then, without the pin to help support the front clamp making it the weakest point with all the pressure on it, the back one couldn’t hold on it’s own, particularly when I hit that pot hole. With a few choice words about my carelessness, I pulled the food and water out of the front and shuffled the smaller, lighter things that would fit in the front section. I hated putting the things that could leak in with my sleeping mat and tent, but there was nothing for it. Then I got to wriggling around on the ground with a roll of duck tape. I actually managed to get the front clamp back into shape and pinned before I buried it under layers of sliver plastic, fabric and stickiness. While fighting with the back one, I realized a cheap nut and bolt would work to help strengthen it the way the pin did the front one. So, my Burly wasn’t completely ruined by inattention! What a relief! I still held doubts as I looked at the tongue and clamps wrapped within an inch of their lives in silver tape, but there was only one way to find out. That chore done, I took a few minutes to rapidly chew my way through an apple and went for a quick peek at a small building about 20 feet from Loke’s tree. To my relief it was an outhouse! A nice clean one even. No smell and no bugs. I was a little irked by the nice big windows without curtains or even frosting, but it was better than trying to find a hidden spot along a road. A lot less traffic. 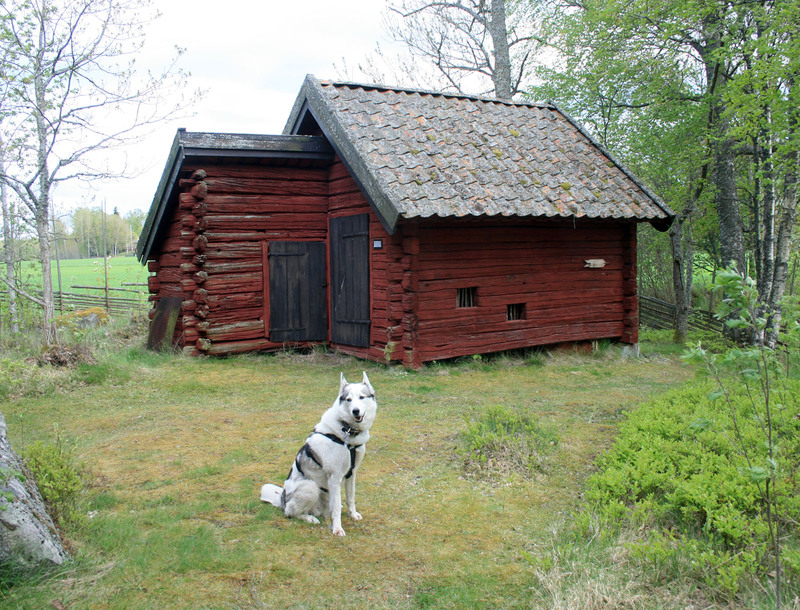 By the time I got back from my quick loop around the humdrum church without a single runestone, Loke was standing impatiently as close as he could get to the trike and wagging his tail. I always interpret that as ‘We go now?’ After a quick double check, I hitched him and we moved out. I wanted to take it easy, but Loke of course, had another agenda particularly since the road leading away from the church had a 10% or more grade for a quarter mile stretch. He kangaroo hopped down most of it because of my reluctance to tax my duck tape work. The path along side the newly paved 56 was only loosely packed gravel which took a little work to get the trike and trailer through. Loke helped a lot, with almost 2 inches pulled out of the spring bar. Very quickly, we crossed the 56 to head toward Satrabrunn (Satra Well). The place is only 2 or 3 miles from Fläckebo Church that I ended at last ride, hiding in the barns from the storm blowing in across the small lake. It’s mentioned in my Sverigeleden map books mostly because of an old apothecary building and a brunnkyrka (well church). I was curious enough to incorporate the place into my ride. It was about 3 miles from the 56 (hot for Loke). I stopped about 4 times to give Loke water and soak down his ears along the way. One of the water breaks, I found the very simple looking well church. In spite of my attempts, I’ve been unable to find out what exactly IS a well church. Does it house a well? I can’t find the answer any where. Though it meant going past our turn toward the next church a few miles away, I decided to go look at Satrabrunn proper. We could always double back the quarter mile (if that). The place surprised me. It was quite a popular tourist spot in spite of its small size and relatively remote. I couldn’t really imagine people saying, ‘Hey! Let’s go to Satrabrunn for the day!’ Maybe it catches people who are on their way to Sala for the afternoon or on the way home. Or perhaps it’s the 300 year old spa history of the place which draws people. The place was first established as a rehabilitation spa 300 years ago and there is a well in the well house. A collective of like minded people turned this place around to keep it from being sold piecemeal which could have ruined the place. I made the turn into the village proper, passing a couple old wooden building set up as shops for handicrafts mostly. The parking area was pretty close to full and I went onward following the signs to the cafe. Beneath the dense shade of 5 or so old trees enclosed by a number of older buildings like a kind of court yard or town square, a dining area had been set up. The cafe took one building, with an old closed apothecary, another into handicrafts shop and I’m uncertain what the remainder were. Near what appeared to be stage I stopped since it seemed far enough away from the tables I didn’t think anyone would object to Loke’s presence. We did cause a bit of a sensation, most of it directed at the furry one rather than my trike. Since we’d gone through more than half a gallon since leaving Sala, the place offered the perfect chance to refill. I made sure Loke drank his fill and then topped off his little dish for good measure. At the little window next to the cafe’s main entrance, I asked the girl if there was a place I could refill my bottles. With a big smile, she offered to do it for me. I thought about buying an ice cream while she did me the favor, but it seemed cruel since Loke couldn’t share. So, I settled for a cold soda. A man came up on one of those scooters people use when their ability to walk is compromised. He was smiling at Loke as I walked back and asked me a little about Loke and, for a wonder, even about the trike. Loke seemed content to rest in the shade as I sat at an empty table to sip my orange Fanta, look at maps and take a few pictures of the buildings around us. We rested in that charming place until Loke stood up to pace with an expectant look. The road we took south was another unpaved one. It wasn’t a bad road, though not nearly as smooth and hard packed as the previous. Even after more than 5 miles, the trailer still held together fine so we went on. I forgot to mention, the trike handled much better after shifting the weight in the Burly. Imagine that! I worked hard to keep Loke to the smoothest part of the road. Anything that might save his feet. We did manage to go a little quicker down the road as it had a decent amount of shade. Amazing how even a little shade as you move in and out of it helps. During one of the water stops, we sat next to a rather extensive stretch of recently plowed fields. Once Loke had his fill and I’d packed bowl away, I settled back to listen to bird song and look around. Only then did I notice the huge numbers of dust devils! There were 8 or more of them I could see any given time. Most were small things, barely a meter in diameter and thin. One was much bigger, 3 meters or more across and sucking dust higher than tree canopies less than 50 meters from it. That monster crossed the road. It dissipated before I could dig my camera out. Another nearly as large soon replaced it. Starting in the big field on the other side of the road and winding along the same path of the previous onto the smaller field on our side. I’m sorry I missed catching it when it had split into two distinct, strong but smaller vortexes that orbited a common center before rejoining into one. That would have been a neat picture. Watching the dancing spirals of loose earth reminded me of the time Loke and I were caught in a dust devil on one of the short loops around home. The fuzzy one really hated that, trying to run with his tail tucked while getting pelted with dirt and grass. The devils were eerie to watch with the wind so calm around us. It made an interesting show while resting. As we reached the trees on the far side of the fields. I passed a house with a few dog pens. About 100 yards further along, I noticed a new structure being added to the side of an older building. At first I thought it might be a dog kennel, but perhaps a chicken pen. Loke and I both jumped at the sound that suddenly came out of the meshed in area. Loke actually left the ground with a startled yipe. What was it? A peacock’s call! Not something you expect to hear while pedaling along a dirt lane in the countryside. I didn’t see the bird, but it gave a another of those distinctive calls and Loke poured on the speed to get away. Loke’s fear of peacocks didn’t last long. Less than a quarter mile on, I was admiring a big healthy rooster lording it over his hens in a large secure pen in the lee of an old barn as we passed. The trike gave a sudden lurch of acceleration from about 6 mph to 12 mph as the furball gave an desperate whine. With a wailing cry of alarm and flash of feathers, I saw a full grown peacock erupt out of the ditch where I think it had been attempting to hide until realizing it had been spotted by a prey-crazy husky. Once he’d seen one, he wanted it! Never mind the noises it made! Clenching the brake with one hand and clinging to Loke’s harness with the other, I started laughing sympathetically for the bird. He ran (very fast) as Loke continued to strain against the brake to reach him. The poor thing kept trying to get through the property fence. Run a few yards and waffle back and forth in desperate search for an opening, then run a little more to repeat. He was a huge beautiful specimen of pea fowl. Long tail that looked flawless though hard to say since he wasn’t displaying it, but his colors were bright with that iridescent gloss over the blue of his body feathers. Finally he made a weird honking sound rather like I’d imagine a squashed goose might make and with a heavy ‘whap, whap, whap’ of wings, took to the air. While not as fast or graceful as a swallow, it got him over the fence and from there he did pretty good getting high enough to clear the tall trees (40 – 50 feet) and vanish. Still laughing, I stopped and Loke did a tap-dance with his front feet, muffled by the socks and whined again. He really wanted that peacock. I obviously didn’t get a picture because of the lunatic harness to the trike. It was definitely one of those times when having a helmet mounted video camera would have been great. The unpaved road got a little rockier after that. I had a very hard time trying to find smooth spots for Loke to walk/trot. Then it began to happen. He’d be going along and abruptly, I’d be watching him with narrowed eyes wondering if he had just limped a step. That went on for the rest of the dirt road. Not quite clearly seeing him obviously limp a step, but something making me wonder. I’m either getting more paranoid when it comes to him or learning to trust my instincts. We weren’t too far away from the 2nd church of the day. Once we were on pavement, if I had been half seeing limping strides from Loke, he didn’t do them any more. I didn’t dismiss it so quickly though. Soon we reached Haraker’s church. Like Kila, there were quite a few visitors to the church, so I decided to leave Loke parked in the shade of the bathroom building outside the churchyard wall while I did my walk around. Haraker’s had more in common with Kila than number of people around. The color was a little more orange than pink. The windows slightly different as was the top of the steeple. Beyond that, both were identical neoclassical, rectangular boxes with no runestones. Back at the trike, I tried the bathroom door only to find it locked. I think that’s a first. I certainly can’t remember a locked bathroom door at any church with toilet facilities on its grounds. Defeated on the potty break, I turned my attention to Loke. I pulled his socks off and made him walk on the gravel drive. There it was. That slightly limping, tender-footed walk I despise more than ever. I almost believe Loke was trying to hide it. In spite of the warmth, he really seemed to have enjoyed the outing. I spent a little time weighing my options. In theory, I could have pressed on to find a camp spot as quickly as possible to see what the morrow would bring. A quick look at the map made me think quickly accessible places would have houses too close or be crop fields. I possibly could camp at the church once evening services had finished. There was a nice stretch of lovely, smooth and recently cut lawn that would have added its lush softness to my sleeping pad. The problem was, what if Loke’s feet were still tender the next morning? What if they seemed fine for 5 miles and then got sore again? Jens had a busy day the next morning and it might have meant sitting on the side of the road for a long while. If it had been just me to worry about, I would have pushed on to find some place to sleep and see how I felt the next day. I find myself less inclined to take such risks with my furball. I called Jens. He didn’t push for me to stay out. I think his attitude matched mine in regard to my tours. If it had been me uncomfortable, he would have encouraged me to wait until tomorrow. Loke limping even a little, better to call it. I removed the harness and settled Loke where he had a nice patch of grass and shade to lay in with a full water dish. Then I removed the trike seat to fix a problem with my steering boom. The center clamp had come loose letting an irritating forward/back/side to side wobble in the handles which made steering a bit weird and even difficult at times. It was quickly fixed. Took me longer to remove the seat than tighten the bolts. By then, the wind had kicked up and it actually felt a bit on the cool side in the shade. I took Loke to the edge of a field which was downwind and attacked him with his brush. Most of it, as planned, blew away across the freshly plowed dirt. I didn’t want to litter that pretty lawn with a carpet of white fluffy fur. Though we’ve had him for nearly 7 years now, it still boggles my mind how much he sheds when he’s blowing his coat. 30 swipes with the brush on one spot will give you nearly as much fur on the last swipe as the last. It just keeps coming. Still, I did what I could and nice to not strangle the vacuum with it. All in all though, I felt very disappointed at cutting it short. I desperately wanted this to be a tour. My wonderful husband is being as encouraging as he can be about it. Saying at least I did the planning and packing which can be the hardest part and I overcame the broken trailer. It held up fine and needed the duck tape cut loose to dismantle the trailer. I didn’t suffer in the heat for a change. Every positive about the ride he could think of he named. With the slow pace and frequent stops we’d covered a bit over 18 miles for the day. That’s the Börje/G. Uppsala loop around home. I think Loke and I both enjoyed it a lot more than the close to home rides. What now? I’m not sure. Loke’s tender footed ending to this not very long ride has left me with a lot of doubts since I took every care I possibly could. Socked him very early, tried to give him the least rocky surfaces, took it slow. Short of him leaving him at home every time I go for a ride longer than 5 miles… I don’t know. Drama Synopsis & A REAL Ride!! Moody at the gorgeous weather I can’t tour in because of foot problems both for me and the dog. To add to it, Loke had a seizure of some kind on Tuesday, March 15. Was about to rush him to vet except he was fine in less than 5 min. Waited until his appointment for surgery the next day. Much to my relief, Niclas canceled the surgery and checked Loke thoroughly, but he found nothing wrong. Surgery to remove the eyelid polyp rescheduled and I’m to call Niclas immediately if the furball has another episode. Niclas is mostly satisfied with improvement in Loke’s feet so now we’ll wait for the infection to return and get a sample when it does. The long gory version of the events are in the previous post if any are interested. By Friday morning, I think my husband was beginning to feel a little irked at my grouchy depression. Around 10 am, he decided I should go for a ride. Stubbornly in my deep funk, I grumbled I couldn’t be bothered to slog around the River Loop yet again. Cheerfully, Jens said he’d drive me anywhere I liked and promised he wouldn’t make a single complaint no matter how far. He stuck to that statement even when I suggested an area nearly an hour and a half away. I took him at his word and plotted a convoluted ride from west of Sala to Sala itself as I did zig-zags to things I might want to photograph. Though I didn’t expect to do 25 miles, that’s what I mapped. It’s always better to have a little too much distance planned than not enough. Two hours later, trike, dog and we were in the car and driving west. During my planning and packing, the clouds had begun to thicken, but gave no sign of rain. Fortunately, the farther from Uppsala we went, the clouds became less dense and closely packed. We arrived at Västerfärnebo church a bit before 1 pm. The village was a bit larger than I thought, but by no means a bustling metropolis. As I walked around the church to take my photos and look for runestones, Jens walked Loke around a park area not far away where he got to meet a female German Shepherd/New Foundland cross. Quite a pretty dog from what I could see in the distance. Putting the trike together and loading it with pod-bags and camera was a bit of a challenge as Loke insisted on staying glued to my right hip in ‘ready to run’ mode. Jens had his hands full trying to keep me from getting tangled in a cat’s cradle of flexi-leash, but I think he enjoyed it since he could have retreated and kept Loke short to avoid it. Soon I was settled and clipped in. Jens told me to have fun and reemphasized his promise to come get me as soon as I called without complaint. Loke hopped and yodeled as we did a loop around the triangular meeting of streets by the church for the GPS to get directional bearings so I knew which way to go. In moments we were off like a shot. All of it was pretty much Loke as I didn’t want to put too much abuse on my ankle. This was going to be a leisurely outing as far as I was concerned. Putter around new places, enjoy the gorgeous spring greens and whatever scenery and landmarks that caught my attention. Loke, of course, had other plans. One of the many nice things about small villages/towns, is that it takes no time at all before you’re out of residential territory and into the true country side. Cloud-shadows dappled the scenery around us, but for the first couple of miles, Loke and I ran under glorious sunlight! It was moderately windy, but not brutally so and the greens of the trees in the wooded stretches and where the fields had not yet been plowed were vivid and fresh with that touch of golden emerald you find only in the first blush of spring. The temperature was perfect. A tiny bit cool in the wind if you sat still, but once you started moving and warmed with exertion, it was just right. Loke might disagree with my assessment of temperature. He seemed a little warm, but not dangerously so and was very determined to run no matter how I tried to moderate his speed. I finally gave in for a while rather than have him strangle himself on the harness. I couldn’t stop the smile that turned up the corners of my mouth as the road hummed beneath the trike tires and the spring in Loke’s tether bar squeaked in time with his steps since I wasn’t pedaling furiously enough to keep him from pulling. Birds fluttered all around and of course, chief among them were the meadow-larks with their beautiful songs. Weeks of frustration and moodiness fell away. It was wonderful to be off the hamster wheel and roaming wide open spaces! The only way it could have been more sublime would have been the rattle of my trailer behind me and more new roads to discover on the ‘morrow. Even so, I was determined to enjoy what I had! I wasn’t the only one who was out to enjoy the day with human powered wheels beneath them. I spotted the old barn tucked among the trees and took the opportunity to offer Loke water before taking the picture. Maybe it’s age, but the furball now needs a few minutes to let water settle before running on or he burps most of it back up. So, dog watered and while taking the camera out of the bag, I saw the distant shapes of two or three cyclists. Then it was many, many riders. It was a huge group of men and women between the ages of 45 to probably as old as 70’s. Wouldn’t surprise me if there were a few older still in the mix. They were all smiling as they passed me on their touring bikes with friendly ‘Hej’s and a few calls of ‘Nice dog!’. I must have said ‘Hej’ back some 30 times. It would have felt rude to do it less when someone who added their greeting hadn’t been close enough to hear my previous. I didn’t count, but I’d guess there were nearly 40 riders. While enjoying the ride immensely, particularly when I came to the western shore of a lake, I also kept a very close watch on my cycling partner. Was his pace normal and smooth? Breathing okay? I stopped to check his feet frequently since they don’t seem to be toughening up as well as they did in previous years. A few times, I even checked his gum color just to be sure. There were a couple annoyances to the ride, but they didn’t dampen my humor in any way. The first was the unreliability of my iPhone. The coverage of the provider is sketchy at best in any area that is remotely rural or wilderness. My old, very basic Nokia has wonderful coverage, but with the short notice of the ride, I hadn’t a chance to charge it. So, I was a bit concerned something might happen to Loke and I’d be unable to reach Jens. The other was lack of socks for Loke. The skin on his pads was beginning to look a little thin even just after 5 miles. I had his boots, but Loke despises them and has figured out how to shake them off while running. Gets annoying to stop and run back to reclaim a doggie boot every half mile. When out with the fuzzy one, I also keep a careful eye to the ground well ahead of where he’ll be treading. It saves him from many a cut foot or punctures. Probably spares my tires as well. Good thing I do, though this time the damage wouldn’t have been to Loke or myself. It was also an example of how the subconscious brain can recognize things before the conscious part does. I noticed a stick on the edge of the road. From 100 feet away, it looked like every other stick. I’m sure I see plenty of sticks but my brain dismisses them before I actually notice them. This one I couldn’t take my eyes off of. Abruptly, I realized it was a snake. I had time enough to swerve to keep my tire from crushing it’s head and neck, but not enough to be sure Loke didn’t step on it. I hope his paws missed it. It was such a pretty little thing, not much longer than 8-10 inches or so and in appearance was identical to the ringneck snake in the US. Might even be the same snake just as Sweden has identical dandelions that are the bane of US lawn owners. I like snakes and have no fear of them so the idea Loke might have stepped on it worried me. I stopped to hurry back for look. It was nowhere to be seen so hopefully, it escaped injury. Shortly after the group of bike riders and the snake, the clouds began to thicken. While many of them had been very gray bellied for quite a while, I’d seen no rain veils. Once those appeared I began to watch the skies more closely. Around mile 7, significant clusters of rain made their appearance. At those first few wet drops, I stopped to wrestle the rain-cover onto the camera bag. The clumpy nature of the clouds made for some gorgeous scenery. The dark, ominous undersides serving as a backdrop for the sun-dazzled green of new leaves and fresh grass. Occasionally, there were the beautiful streaks of god-rays spearing across the sky. Common Canada Geese, But What a Setting! For once, the weather seemed to take pity on me. All around were heavy masses of steel gray with gossamer curtains of falling rain. Yet somehow, they missed me. Occasionally I felt a few touches of wet on my cheeks brought by the rising wind, but nothing more as I was treated to the dazzling displays provided by the places where the sun found gaps. I was even lucky with the wind. I wish I could say it was planning, but I admit I didn’t check the wind direction before deciding to go west to east via north/south. If I’d tried riding from Sala on the plotted route, it would have killed me once the rains began moving through. The air speed had gone from mildly brisk to impressive as I finished rounding the southern edge of the lake to turn north. Tree limbs whipped in the gale that filled the countryside with it’s low, distinctive roar. At times Loke squinted and flattened his ears. A few miles from Fläckebo church I decided it might be time to call Jens. While Loke still jogged along fine and wanted to run with every downhill, his feet were looking too worn and I’d already applied Musher’s Secret several times. It really seems to help, but it has its limits even with multiple applications. Short of duck taping Loke’s boots to his legs, they wouldn’t stay on. Not to mention, my legs were feeling a bit achy. Maybe there had been a bit of a fight with wind. Or perhaps it was hills. I pulled into a bus stop to call and tell my wonderful hubby where he’d be able to find me. The mile between where I’d called and the church, I passed a pretty little house with a cafe sign. The temptation to stop in hopes they were open was strong, particularly when a man sitting outside gave me a cheerful wave. It wasn’t so much that I was hungry or thirsty, but I desperately needed a bathroom. I’m not squeamish about answering a call of nature in actual nature, but finding places to do so out of sight of passing cars yet able to keep an eye on the trike is the challenge. I’d found no such places. Of course, my sense of polite and rude wouldn’t let me go there without at least buying something to drink. Since I had no cash on me, I gritted my teeth and hoped maybe there’d be a place at the church. Fläckebo church, like the previous church, had no runestones lurking around it. I’ll admit to a certain amount of disappointment. A ride just doesn’t feel complete if I can’t find at least one runestone. After circling the church, I noticed a dirt track running along the out side of the church yard hedge. A sign pointed down it with the symbol used for sights of cultural heritage. It was within easy view of the church. Jens would be more than an hour driving from home, so I decided to go look. I hoped for something interesting and for some kind of shelter in equal parts. The wind was by severe enough to strip young leaves from branches and made white peaks on the choppy lake. 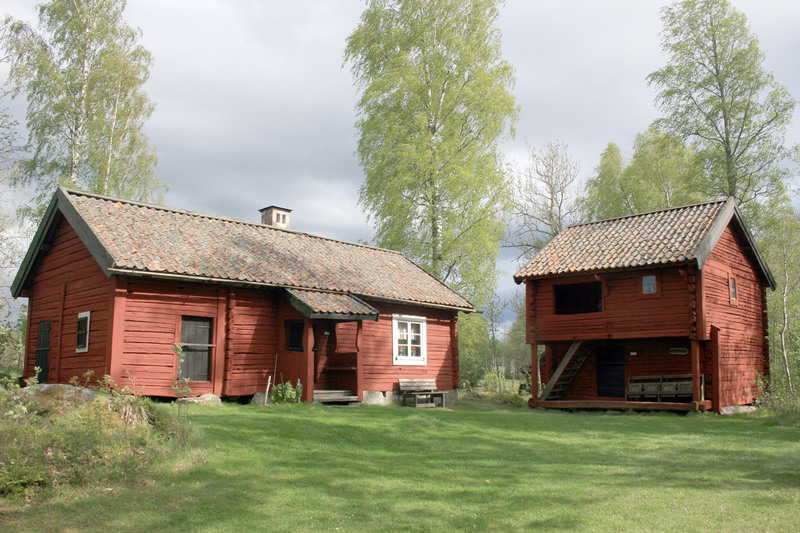 There, I found a collection of old farm buildings much like those at the Gamla Gården (Old Farm) near Uppsala. It lacked a house from the 1700’s, but had a wealth of other buildings. Best of all? A runestone! I wasn’t even disappointed that it didn’t have the small informational metal plaque or official number most stones are given. There was a sign for it though. It is simply known as the Odendisa stone. Loke was just as happy to romp around at the end of his leash, sniffing and marking everything as running with the trike. He did his typical flop down and thrash in the grass more than a few times. As it was the end of the ride, I made use of a bench placed in front of the stone to change from cycling shoes to my black and white Five Fingers. They don’t aggravate the persistent problem in my ankle and I hoped I could at least take a brief look at the buildings. I planned to wait for Jens there since it had a better parking area to load the trike than the spot near the church. Five buildings sat in the shade of the tree, overlooking the lake and the threatening storm clouds. Understandably, they were securely locked and the only one that offered any sliver of shelter stood so far from the parking area, I could’t see Jens arrive. After taking the pictures, I returned to the bench at the runestone. The trees and the low hollow where the stone stood offered some protection from the wind. I kept my fingers crossed the worst of the weather would continue to miss me. A futile hope, but one I entertained all the same. I saw the rain before it actually reached me. It came sweeping from the south and west as a faint gray blurring of the southern lake shore and field. I took a moment to consider my options. The cafe? It looked more like an outdoor establishment than a place you could sit inside and watch the rain and wind rage through a window. There had been some buildings behind the church. I decided to make a figurative run for it. I quickly discovered Five Finger shoes are not good with the pedal clips. The small surfaces were slick as glass under foot. I took it very slow so to avoid injury if a foot slipped and hit the ground. I bumped down the dirt road as the nearly horizontal rain arrived. Of course, Loke kept giving me the predictable side glances as if to hint he thought I was crazy to be out in such bad weather. I agree. The combination of the wind and rain was cold! Most of the buildings behind the church turned out to be old stables! It seems the church provided a stables for its parishioners from specific places in the area. This stable for the horses for people from here. That stable for horses from that place. Amazingly they weren’t locked! I picked one, moving the rock holding the door shut and went in. I didn’t close the door completely since I didn’t want to sit in pitch black. A little rain blew in, but I stayed mostly dry. The iPhone had no signal, leaving me with little to amuse myself. A man puttered around in a large tractor through the parking lot the stables surrounded. I expected to be asked to leave, but all he did was wave as I peered out through 10 inches of open stable door. The size of the stables surprised me. The doors were fairly small and narrow. Hard to imagine anything larger than a medium sized pony getting through it. Three stalls divided the space within which seemed a very tight fit for even three medium sized ponies let alone horses. Couldn’t see a bulky plow horse wedging itself in at all. By the time Jens came, the rain had gone and the raging wind had stilled. I had to laugh at that. Though Loke and I had gone barely 11 miles and had taken 3 hours to do it, I was happy. We’d taken our time. Lots of stops to give Loke water and then wait for it to settle. Lots of pictures and beautiful surroundings. I didn’t care about the distance. Only about the time well spent. Though Jens had been home for barely an hour before I called, he remained true to his word. Not a single complaint spoken. Only how glad he was that I had enjoyed myself. I’ve barely been riding outdoors because of the dratted ankle. Even though I can wear my cycle shoes just fine and pedal without wanting to weep, the injury in my left leg simply would not allow me to get the trike out the door. Carrying the extra weight of it as well as the three trips up and down the stairs required have been impossible. My husband has been unable to work from home so hasn’t been around to take everything out for me. So, I spent the better part of two weeks pedaling on my trainer and staring out the window with growing frustration at everything barring my way to packing trike, trailer and dog to get out on tours. The weather has been near perfection for riding and camping. A little windy at times. Occasional spats of rain, but not too hot and not too cold and mostly sunny. The feeling of being penned in has been making me moody and sour. I know it though felt fairly helpless to correct it. Then of course, pile on more worries about my beloved furry cycle partner. I came very close to having a long hysterical cry. Loke had some kind of… episode. I’m not sure what else to call it. Except maybe a seizure? My husband went to take his dinner plate to the kitchen on Tuesday. Loke, for some reason, seemed more desperate than usual to want to lick it clean like he used to do. He was bouncing around and did a couple whirls and then suddenly, his body went weird. He began thrashing around as his forelegs went stiff and balance seemed fail him. His hindquarters appeared to lose coordination and hind legs buckled. With his front legs still sticking out like planks, he would have toppled right over his tail into the shoe rack if Jens hadn’t grabbed his collar. I went to help as Loke still struggled for some kind of equilibrium, but seemed disoriented. His heart was hammering inside his chest. It felt more like a fist thumping his ribs from inside. Once it started easing, I was in motion. I ignored my foot to hurriedly pull on shoes, grab my purse and leash the furball who sat with a distinct leftward tilt. When Jens asked what I was doing, I said I was taking Loke to the vet before he closed. By the time I was ready to go and began the short walk to the parking lot, Loke was fine. From full blown fit to normal husky in less than 6 minutes. I was suddenly at a loss. Reluctantly, I decided to wait until Loke’s appointment the next day since all Niclas would see any way was a perfectly healthy dog. Niclas was shocked when I told him about the episode and I think a little disappointed I hadn’t at least called. We decided it would be unwise to subject the furry one to general anesthesia so soon after the unexplained occurrence. He did give Loke a thorough going over. Checked his eyes for normal responses, make me walk him around, listened to his heart when I told of how hard it had been beating. He decided we’ll give it a week to see if it happens again. If it doesn’t, he’ll still take blood tests and we’ll decide to go through the minor surgery or not. If it did happen again, I was to CALL HIM. Even if it was a weekend evening. As for Loke’s feet, Niclas thought they looked pretty good for the moment, though not entirely satisfied with the toe nail. He decided we’ll not do any further treatment though. That way, if the infection returns to the skin between the toes or between the foot pads, we can get a clean sample for analysis. Just keep the feet as clean and dry as I can. Thursday, my mood was even worse. Too worried to take Loke out the door for even a rolling walk even though Jens was home to be my strong back (and ankles) to get all outside. I didn’t even have the oomph to go on a River Loop or Ulva/G. Uppsala loop alone. It has to be said. Jens’ patience with my grouchy, half-crippled self has been astounding and thanks to him, I did go for a ride yesterday. New post for that though! It finally happened. 105+ posts and 10,000 views. Not bad for something I started just to show my family the country I live in. Other than that, not really much to post about. I’ve spent the better part of a week with my foot propped up, eating anti-inflammatory meds and staring wistfully out the window at perfect touring weather while tending to Loke’s foot 3 times a day. The wounds on the bottom of his feet have healed, but the discoloration on his fur has gone very intense and dark instead of clearing up. The toenail that had me calling the vet is looking more normal, but the one we were originally worried about doesn’t seem to have improved much at all. Just waiting for the next appointment which will also be surgery for Loke. He has a little growth on the lid of his lower eye needing removal. It’s been removed once, but has made a return appearance. And to think one of the many reasons we chose a husky (other than the ability to run) was because they’re a very healthy breed with few problems. My ankle is slowly improving though I had one set back. Apparently, man-handling a heavy cast iron pot around in the sink to clean it was too much for it. My normal sneakers kill me, but I can wear my black Five Fingers and, oddly, my cycle shoes okay as long as I leave the laces loose. Since the doctor told me to keep weight off my foot, but move, I’ve been cycling on the trainer quite a bit. I did go for an outdoor ride of about 4 miles a couple days after the hospital visit. My husband was home so all I had to do was get dressed and hobble out. No way I can carry the trike myself in this condition. It’s heavier than a cast iron pot… even a large one. The day was nippy, but it still felt good to get out. The chill got to my ankle, making it ache which is why it was only a 4 miler instead of a 6+. All to be said about that ride. Oh! Random bit of news that could put an interesting spin on touring. There was a bear attack a bit north of us. When I say a ‘bit’, it’s probably about 100 km (60 miles) from Uppsala or so, but not too far from some streams Jens and I go to fairly frequently to hike and fish. The thing is, it’s in a fairly populated area of Sweden. If it were 500 km north, I wouldn’t have been surprised at all, but we’re talking about an area not too far from home where I could be touring. Pedaling around with food and a dog with bears lurking sounds a bit exciting, doesn’t it? Especially European brown bears which are essentially like the cranky American grizzlies. I have to admit, I’m much more concerned about bears than about wolves, one of which was running around IN Uppsala just a month or so ago! Pigs and bears and wolves! Oh my! Really it is. If it’s not Loke, it’s me that is the obstacle to going on a tour. I’ll try to stick to a rough order of things on this update. I did call the vet as soon as it hit 11 am, hoping not to wake him like the last time I called when the clinic was closed. Niclas listened patiently as I described the appearance of Loke’s toe-nail and my concerns if the infection could make the transition between nail to the bone. He put that fear to ease, but did say the nail might need to be removed if it didn’t respond to treatment. I quickly did research and found that while that might be unpleasant for Loke, it’s not generally a crippler like it can be for cats. We did another River Loop during the week. In spite of the sores on the bottom of his feet and the scary looking nail, Loke went fine. I made sure we went in a more leisurely pace, but Loke seemed to be happy at being out and moving for more than 3 km. We did 9 km (a bit over 6 miles). Not a trace of a limp even when he walked through gravel. That’s about all I can say about that ride. Honestly, unless a pheasant jumps out at my head or the like, it feels a little silly to even mention the rides. It would be kinda like a hamster blogging about his nights on the wheel. ‘Ran last night! It was great!’ ‘Ran last night, but felt a little off. Must have been a bad sunflower seed I ate’. We were coming up quick on the long weekend for May Day. I had the car on Friday as Jens took the train. Loke and I went out to the woods for another walk/shuffling run. The furry one wasn’t quite as well behaved or funny on this one, but not a nightmare either. So, we walked until coming to a spot in the path that turned into 10 meter stretch of bog with no way around it. I didn’t run much, but we still had a nice walk. In the evening when taking Loke out to mark the shrubbery, putting on my shoe hurt. It put pressure on the area around my ankle bone which felt bruised as if slammed against something hard. By Saturday morning, it was worse and I was limping. We did go out to Gysinge (aka The Streams) with the intention of trying out the new camp stove, walking Loke and letting Jens fish. Turned into me sitting at a picnic table, reading a book in the sun while Jens walked Loke before deciding not to fish. We did try the stove to boil water for Jens’ coffee. It did it quicker than our water boiler at home could do a liter. Pretty impressive. It continued to get worse through the May Day weekend. Monday when the scent of bonfires filled the evening air and sounds of merry-makers filled the streets, I could barely walk at all. Tuesday, officially May Day, as I woke to the reek of old, HUGE fires as we do every May 1st. It really does smell as if the entire city caught fire. Tuesday, it got even worse. The ankle swelled that evening and I debated going to the hospital. Of course, by then it was 9 pm and I decided to wait to see how it looked/felt in the morning. The swelling as gone when I woke yesterday, but still too painful to walk. Even hobbling around the apartment is a challenge. I called the medical advice line and listed the symptoms and order of progression. They advised me to go to the emergency room with my history of blood clots. Resigned, I began to get ready, calling in hopes that Jens’ father could give me a ride. He could and I called Jens to let him know. He offered to come home, but I was fine doing all this alone. So, I spent the better part of 4 hours at the hospital yesterday. I was more worried I’d be put in a cast than I was about a blood clot. I figured I must have done some kind of damage on the Friday walk/run. The medical staff were all great. I got checked in right away to wait in the outer lobby. Sat for less than 15 min before being taken to an exam room to wait for the doctor. That took about half an hour, but at least I wasn’t left sitting in the waiting room for 3 hours. Peter, a very nice doctor, took all the information he needed calmly, asked for a few clarifying details about my DVT (deep vein thrombosis aka blood clot) in 2006 and precisely how this had begun and progressed. After a careful look, he decided it was unlikely to be a blood clot because of the nature of symptoms and location. So, off I went to X-ray. THAT was more tedious. I still have trouble with my tailbone from time to time and the chairs in the X-ray waiting area were down right brutal. I was thrilled when I got to limp back to the exam room in the ER. The results? No stress fractures in the bone so it’s likely a soft tissue injury. He recommended I try to keep moving, though take it easy and keep the weight off the foot as much as possible for at least a week. That means I can at least pedal my trike on the trainer. No touring and the weather has been utterly glorious and perfect.